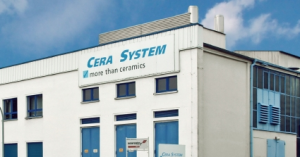 CERA SYSTEM is a medium sized company with over 100 highly skilled and dedicated employees. We manufacture large scale production precision ceramic parts as well as system solutions using ceramic components. Our customer base includes many well known international companies. Using our in house research & development and sales engineers provides cost effective solutions for our customers. Our lean organizational structure and state of the art production facilities allows our highly qualified personnel to manufacture a product once the material has been chosen in a matter of days rather than weeks. CERA SYSTEM is certified in accordance with DIN EN ISO 9001:2000. We deliver the highest quality in the market and on time. Our long standing cooperation with universities and institutes allows us to develop and provide cutting edge technology for our customers. In recent years, Cera System has obtained considerable experience in the copper mining industry (Chile and Arizona). Alongside pneumatic transportation (taps and pipe wear protection), the extraction and filtration of copper concentrate is a challenge for ceramic valves. Abrasion and corrosion occur together. In terms of corrosion resistance, ceramic is equal to PTFE/PFA. Where coated valves reach their limits (pressure, temperature, contaminants), ceramic valves (taps and slide valves) are a real alternative. Even a comparison to valves made from special materials (e.g. : titanium, tantalum) is reasonable for ceramic valves. They are often a more cost-effective alternative. In coal-fired power stations, flue gas desulphurisation plants are standard. For more than 25 years, Cera System has been supplying valves for the regulation of the limestone / limewater suspension. The pneumatic transportation of flue ash can likewise be continuously ensured using ceramic valves and pipe wear protection. Coal gasification and liquification plants are fitted with ceramic pressure-release systems. Even in biogas facilities, we have our first references for part-ceramic and ceramic valves, and for ceramic pipe wear protection. The dosing of small volumes containing solids is the strength of our SSC type ceramic disc slide valve. It is characterised by control accuracy and its absence of dead space. Ceramic valves, pipe wear protection, lances and ceramic hoselines significantly increase the service life relative to conventional standards. Municipal and industrial waste incineration plants have been equipped since the start of the 1990s. Alongside limewater, the field of HCL prewashers and SO2 washers also contains highly corrosive and abrasive suspensions. Conditions that Cera System knows and has mastered from its work in chemistry.